Majoring in the Visual Arts, Gabrielle recently received her BFA from Emily Carr University of Art + Design in Vancouver. Her practice is split between painting and ceramics and she is interested in mining the ways in which they intersect. Through her residency with the Caetani Cultural Centre’s CeramAiR Program at the Vernon Community Arts Centre, she’s exploring her painting practice, and specifically the canvas, through the medium of clay. Prior to attending ECUAD, she spent 5 exciting years travelling to over 70 countries on all 7 continents by sea on a luxury cruise­‐liner, leaving her with a deep connection to the ocean. Those years at sea left their mark, and coupled with living on the Pacific West Coast, she finds herself forever drawn to themes of water and reflection, which reoccur throughout her painting practice. 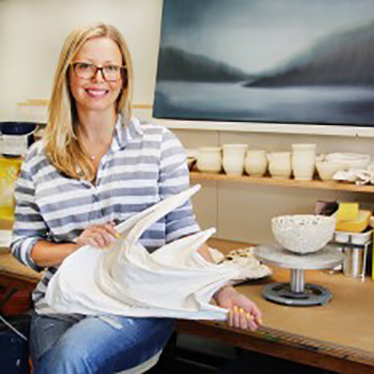 Having recently moved to the Okanagan, she is enjoying embracing a new landscape and arts community.